The previous resident was a character who was called "The Spaceman" of Ocean Beach, CA. He had lived in this place for a long time, so I had a lot of people knock on my door asking "Spaceman here?" I never met the guy, but I heard he was overly fond of the drink and that he also claimed to have had close encounters with aliens, and that he painted space scenes. The beach was only a few steps away, so I got to play a lot of Frisbee. Immediately after the sale of the TeleMagic software company in 1992, I moved out of my small 500 s.f. one bedroom apartment and rented a rambling 7000 s.f. 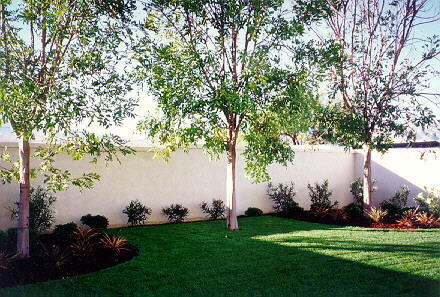 home at 6673 Las Colinas, in Rancho Santa Fe, CA. It was a stunning, brand new home, and had never been lived in before. The builder/owner couldn't move in as quickly as he wanted, so he decided to rent it for a year or so. I wanted a rental because I wasn't ready yet to buy a home, but I needed some room for a few new toys that just wouldn't fit into my tiny apartment, like the pool table, for example. And of course, I needed a garage, which the apartment didn't have, for the about-to-be-purchased Ferrari. And it was important to have a swimming pool, for daily exercise. And at least one guest bedroom, just in case someone dropped in. 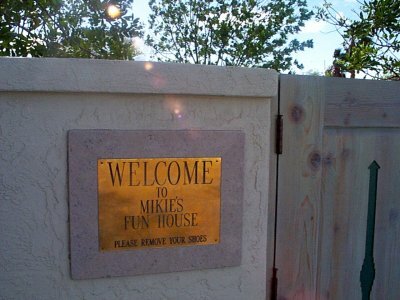 When I moved in, I had a brass sign mounted on the huge front door: "Welcome to Mikie's Fun House - Please remove your shoes". The entire place was carpeted in white, and since it was just a rental, I wanted to turn it over in good condition so that I would get my deposit back. I am a very practical man. The sign you see above was removed from the door of the first place and installed by the main gate on the wall around the pool at the new, improved Fun House in the desert. I lived there and entertained and learned about how life can be lived in a place other than a miniature apartment, and planned the ultimate place to live. This was the first, version 1.0, and the next version was going to be even better. The first thing that had to go were the walls! Walls create separation, people from people, people from toys. There is just no reason for walls except to hold up the ceiling. So it was decided that his home of the future would have no interior walls, that everything would be in one big "Great Room". 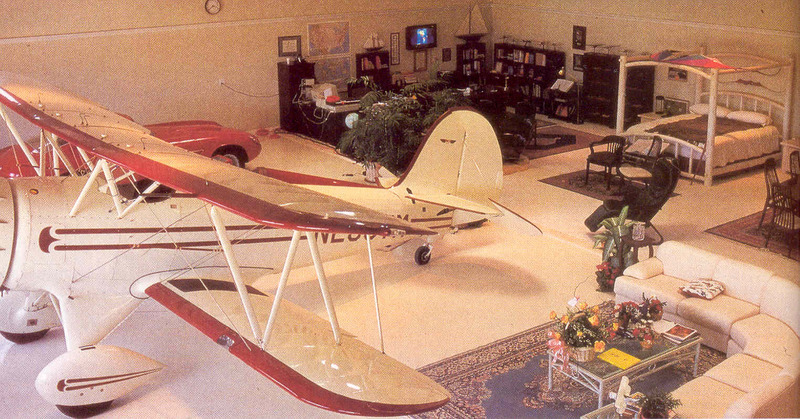 Including the cars, the biplane, the bed, the pool table, the office, the library, and more! Thus began the search for a such a place. 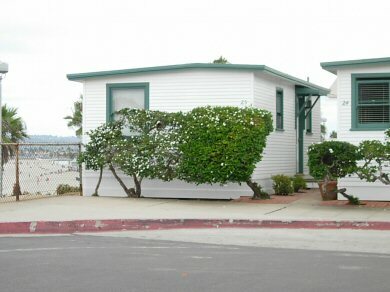 In all of Southern California, only one such place existed, and it was found on a private airport, shared by only about a dozen homeowners, in the desert east of San Diego. 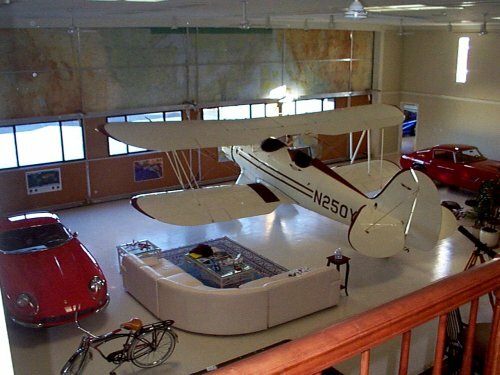 It was, when purchased in 1994, simply an airplane hangar, but of sufficient size, and with zoning that also allowed it to be used as a residence. It was immediately improved to support life as well as aircraft, and I lived there for a year to take the measure of the place, and the moods of the desert. Then a major renovation was started to upgrade the place to a truly unique, first class home that would fulfill the fantasy of "Mikie's Fun House". 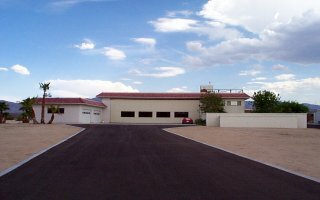 The main complex consists of a 4-car attached garage on the left, the main two story hangar/home in the center, and a walled-in pool and patio area on the right. 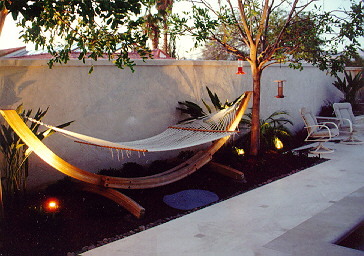 Visitors enter the home through the main double gate in the walled-in pool/patio area, are invited into the courtyard, which is thoroughly shaded with trees to the right and left, and on the far side of the courtyard two more trees, with a hammock hanging lazily between them. 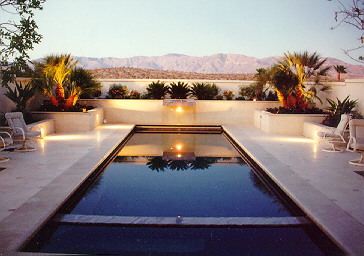 Between the entryway, and the far wall of the courtyard is a 45' lap pool, with Jacuzzi, and a waterfall at the far end to the right. The entire pool is surrounded with lush vegetation in tiered and walled gardens. The visitor is escorted past the pool, and around to the left, under the long shade structure attached to the home, and into the living quarters through double French doors. The first stop is the kitchen and breakfast area that overlooks the pool and gardens. Walking through the kitchen, and another set of double French doors, the visitor enters the massive 3000 s.f. Great Room, with its 16' high ceiling. The front part of this room is for the Waco biplane, and the Ferrari, and the Scaglietti, a rare old Corvette with a hand built Italian body, of which only 3 were made. 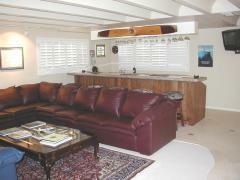 The back part of the Great Room is carpeted in white, with oriental area rugs. In the center of it all is the large 4-poster bed. To one side of the bed are the antique pool table and the formal dining area. To the other side are the den/library/entertainment-center, and the office area. All sections of the Great Room have views of the desert and the mountains beyond through 4 massive 4' x 8' windows in a huge 50' wide bifold door that raises to allow the plane and cars access to the outside world. There are other sections of the home that are more private. A guest bedroom is on the second floor, has its own fireplace and master bathroom, and a balcony that overlooks the Great Room below. A great place to have a morning cup of coffee and enjoy the view. The second floor also features a Pub, which has special observation windows looking into the Great Room, and a balcony that offers completely unobstructed views of the Great Room. Also on the second floor is a small communications center that houses the central security alarm systems, the telephone PBX, the central computer network file server, and the main controls for the rooftop weather system that feeds displays of winds, temperature, humidity, etc. to every TV in the home). Another guest bedroom is on the first floor, with fireplace, and double French doors to the patio and leading out to the walled-in back yard, with its shade trees, lawn, and gardens. From the Pub on the second floor, there is a stairway leading to the roof deck, which is the highest point in the entire valley, and the view is spectacular. Another hammock is set up here for sleeping under the stars. 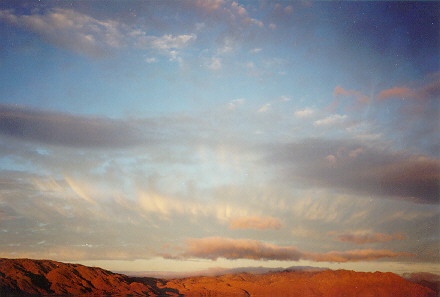 The sky photo shown was taken at dawn from the rooftop deck. Mikie's Fun House is the scene for at least one large P A R T Y every year, in the Spring, when the desert is in full bloom and the climate is at its most temperate. The property is in the middle of California's largest state park, so there is more hiking and 4 wheeling, and exploring than you could do in a lifetime. Aviators fly in from all over the area, and many offer free rides to party guests before taking the day off to enjoy the pool, and the many other toys and diversions of this landmark resort/home. monster Fun House party of 1997! For the rest of the year, this is my private getaway, perfect for thinking, writing, and planning. The perfect place for a recluse, far away from most of society, yet just a few keystrokes to connect to the Internet and to friends around the world. And when the spirit moves, it's only a push of a button to raise the big door, and roll the Waco biplane out, and fly over the mountains to friends in San Diego, Palm Springs, Las Vegas, Phoenix or Los Angeles, all just a short hop by air. 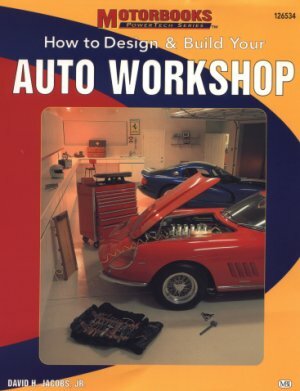 An example of the spare-no-expense focus on details is the 4 car garage, selected for the cover of a book showing "How to Design and Build Your Auto Workshop" (above). This fabulous fantasy home was sold in April 2003. A rental unit of extraordinary rarity. Del Mar oceanfront, whitewater view. Top floor. End unit. Southern exposure. Two balconies. "The Eagle's Nest". The Fortress of Solitude. The Most Serene Monarchy of Mikie. The Epicenter of Good Vibes. The water sounds are from an off-camera water fountain in the entryway.